It has been a few years since we took the girls to see the Harlem Globetrotters, so they were excited when I told them that I would be covering the show for my blog. My youngest was quick to add it to her calendar so that she could count down the days until their stop at the DCU Center in Worcester, MA in March. And, then she sat with her sister to watch different videos of these amazing basketball players/stars that are all over the Internet. 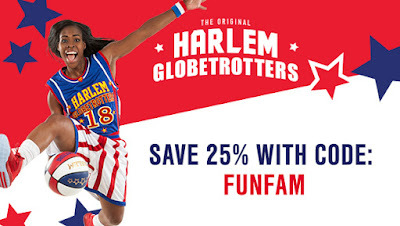 Have you taken in a Harlem Globetrotters show lately? If not, you really are missing out! It seems that with every year that passes that the show gets even better, with more and more amazing tricks being added. And, don't get me started on audience participation. This is what really makes the show great, and I know my girls will be all smiles when we take in the show in March. 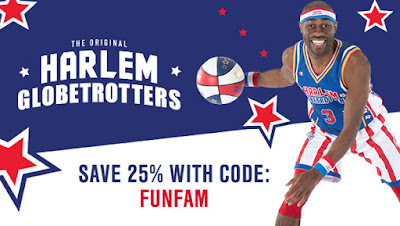 "The Original Harlem Globetrotters are known for their amazing feats of basketball, humor, and acts of goodwill on and off the court. And they have always been about the fans, but this year, everything they do will bring fans closer to the action more than ever before. Join them as they celebrate fans during the all-new Fan Powered World Tour! There will be over 20 occasions before, during and after the game where you have the opportunity to directly interact with Globetrotters stars. Don't miss out - get your tickets today and save 25% off with promo code FUNFAM"